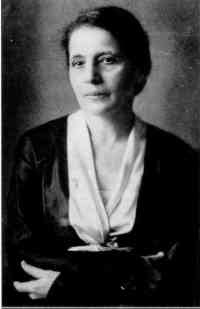 Born on November 7 1878 Lise Meitner played an important part in the discovery of atomic fission. She was the second woman to obtain a doctoral degree in physics from the University of Vienna. At the time many male scientists did not approve of women in science and her career was hampered (including her being omitted from the Nobel Prize in 1944 for her work in discovering the nuclear chain reaction of atomic fission according to some historians). Because of her Jewish ancestry (she had been baptised a Protestant in 1908) she was forced to flee Germany in 1938 (after the German annexation of Austria). In Holland she was unable to get a position so she went to Stockholm, Sweden where she got a position in Manne Siegbahn's laboratory. Working in Sweden she corresponded with her cousin Otto Hahn who she had worked with before she fled Germany and clandestinely traveled to Copenhagen in November 1938 and after corresponded with Hahn to design a set of experiments that Hahn would later carry out that would provide evidence of nuclear fission of uranium. Nuclear fission is the process by which the nuclei of large atoms break down into smaller nuclei. Large nuclei (with high number of protons) will break down into smaller nuclei because the large amount of electrostatic repulsion (positive protons repelling each other) overcomes the strong nuclear force which holds the nucleus together. Meitner (along with her nephew Otto Frisch) discovered why no elements larger than uranium naturally occur; the electrostatic repulsion of so many protons is so great it overcomes the strong nuclear force which holds the nuclei together. She was able to explain the large amount of heat energy produced by a nuclear chain reaction and realized that this process could be used to produce atomic weapons. A nuclear chain reaction occurs when a one nuclear reaction causes one or more nuclear reactions to occur. For example when a uranium nucleus breaks down it releases neutrons which bombard other uranium nuclei and cause them to break down. In turn when these nuclei break down they release neutrons that cause more uranium nuclei to break down. This self perpetuating process produces thousands of times more energy than any chemical reaction. The rate at which this process occurs can be controlled by absorbing some of the neutrons and thus slowing the reaction. In nuclear power plants this is done by inserting control rods which absorb neutrons. In nuclear weapons the process is allowed to continue without moderation.